Anyone who would like to add a head-up display to their vehicle may be interested in a new easy to install device created by Hudway, called the Hudway CAST. 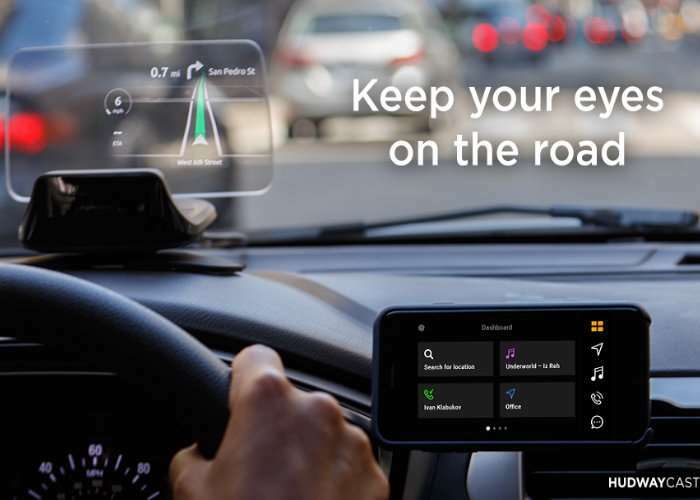 Watch the demonstration video below to see how the head-up display connects to a companion application loaded onto your smartphone to provide easy to view navigation instructions, notifications and more. HUDWAY Cast is a portable head-up display for your car to get directions, receive calls, texts and control your music in a safer and easier way. It works wirelessly with both iOS and Android devices: you always see your directions in your line of sight, while your phone acts as a quick-access control panel. Head-up display (HUD) devices allow drivers to see directions and other critical navigation information right in front of their eyes. HUDs have already made their way into the automotive industry, but mostly as a premium built-in option only a few can afford. Not to mention, these HUDs are programmed to display a very limited set of information preset by the vehicle manufacturer. And because of that, chances are — you will still be using your smartphone for navigation, especially if you prefer driving with Waze or Google Maps. CAST is now available to back via Kickstarter with early bird pledges starting from just $179 and delivery expected to take place during November 2017. For full specifications and more information jump over to the official Kickstarter campaign page via the link below.